A gastro bar? A gastropub yes, but a gastro bar? They’re making it up, surely. Good food in a good bar, it’ll never fly. In fact, I’ll eat one of my many hats if they manage it. So off i waddled, hat safely on head. Hmmm, on arrival it would appear, however, that Peens have cleverly managed to create an atmosphere that balances the two without detriment to either. You can quench your thirst with a pint of Staropramen, sip an excellently made Mojito or glug one of the well chosen wines from the succinct list. But be warned, if you see the ladened plates teeter past you’ll be compelled to try. You can do so at the bar, at one of the tables, or, weather permitting, on the street watching the world go by. In fact why not pop down on Sunday morning and read the papers for free. The money you save can be put towards a top quality sausage sandwich (£3.50) or perhaps a premium Full English (£6.50). But, if noon has passed you needn’t be sad, you’ll be able to chose from tapas size plates such as chorizo, eggs and sautéed potatoes (£7), hearty mains including steak frites (£12) or perhaps the awesome Peens burger that comes in at just under a tenner. Go whenever you can just make sure you do, and If you drop by on Saturday you may just see me applying ketchup to my trilby. 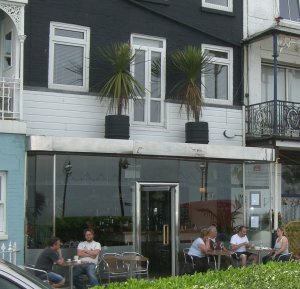 8 Victoria Parade, Broadstairs, Kent, CT10 1QS, 01843 861289.